Fly to the Grand Canyon's West Rim by airplane on this full day tour from Las Vegas. Take in spectacular aerial views of the desert landscape, Lake Mead and Hoover Dam before landing at on the Hualapai Indian lands. Board a bus for a scenic ride between Guano Point and Eagle Point, where you can take a walk on the famous Skywalk (optional upgrade). 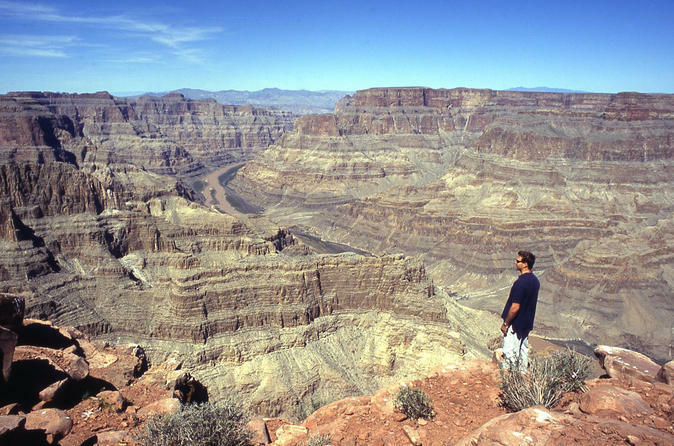 Begin your day with round-trip transportation from Las Vegas hotels for your air tour to the Grand Canyon West Rim from Boulder City, located approximately 30-minutes from Las Vegas. You'll fly aboard an air-conditioned aircraft and capture spectacular aerial views of the gorgeous desert landscape below on this approximate 35-minute flight! Fly over Hoover Dam and Lake Mead and witness the Virgin Canyon, an area en route to the Grand Canyon that is surrounded by colorful cliffs and rocky canyons. Your exhilarating flight will touch down on the Grand Canyon West Airport where you'll board the shuttle to embark on the short 4-mile (6.5 km) scenic bus ride on the High Indian Mesa of the West Rim. Enjoy breathtaking panoramic views of the Grand Canyon from Eagle Point, where you can take a walk on the Grand Canyon Skywalk (if option selected). Following Eagle Point, hop back on the shuttle to ride over to Guano Point to enjoy the views and a meal with a view. Then head back to the airport for your flight back to Boulder City. Your day trip will end with transportation back to you Las Vegas hotel leaving you plenty of time to explore the city. Special Offer - Book for travel by March 31, 2017 and save up to 23% compared to the local supplier's prices! - Book Now!